For all the diverse influences on Hovhaness' music, it is worryingly easy to characterise his huge catalogue in just a few sentences. Woodwind solos predominate, and the brass are usually used for quasi-liturgical chorales. The strings are given well-structured but always simple textures. Percussion is used regularly, but strictly for colour. Complexity, such as it is, almost always comes through Fuchsian counterpoint. And a distinctly folk-like flavour is imparted through the use of, apparently Armenian, modal harmonies. The three works on this disc span a period of over 45 years, yet all those characteristics are as present in the First Symphony of 1936 as they are in the 50th of 1982. Hovhaness settled on a three movement structure for his first numbered symphony, which remained his preferred model throughout his long career. The simplicity of this three movement form reflects the simplicity of the constituent music, and it could be argued that Hovhaness music is hardly symphonic at all, eschewing as it does drama and developmental rigour. Instead, each movement presents a mood, and usually a fairly peaceful one at that. The First Symphony begins with a beguiling clarinet solo over pizzicato strings and exotic tuned percussion. Further woodwind solos follow, interspersed with brusque interjections from the brass. This texture wouldn't feel out of place in the 50th Symphony at the end of the programme, so for all the talk of successive periods and styles in Hovhaness' output, it is difficult to sanctions notions of development of progression in his style. In the finale of the First, the strings play long, even lines, based on some white-note mode and in strict counterpoint between the parts. To my British ears, this sounds for all the world like Vaughan Williams, but the liner notes assure me that the ethnography points to Armenia. The second piece takes us even further east. Fantasy on Japanese Woodprints dates from 1965, soon after the years Hovhaness spent travelling in Asia. It is a concertante work for marimba (ably performed by Ron Johnson) and orchestra, the tuned percussion seemingly intended to imitate the Japanese koto. There are some fascinating orchestral textures here, for example the trombone section playing a melody in unison over a marimba obbligato. But, as with all of Hovhaness' work, the resulting textures are very straightforward and always clearly delineated. The 50th Symphony is named 'Mount Saint Helens' after the volcano that erupted in Hovhaness' adopted Washington State in 1980. Given the serene and orderly style that predominates throughout the composer's work, it is difficult to anticipate what he will do to represent such an event. The answer is: lots of percussion. The results are effective, and certainly dramatic, but always retain that clarity of texture and simplicity of line. The first two movements represent the calm before the storm, or rather the mountain when it was still a tranquil forested idyll, and the geological forces beneath it were still dormant. The predominantly string based textures of the first movement are accompanied by a repeated figure from the celesta that sounds uncannily like a mobile ring tone. Had the piece been written 20 years later, the composer may have thought twice about using this effect, inadvertent as the association of course is. The recording, by the Seattle Symphony under Gerard Schwartz is excellent in every respect. All of the woodwind principals make the most of their solos, the unity of the strings is exemplary, and the balance between percussion and ensemble is ideal. The recording first appeared on the Delos label in the early 90s, and is now reissued on Naxos thanks to one of those close business alignments that the latter company is so good at. 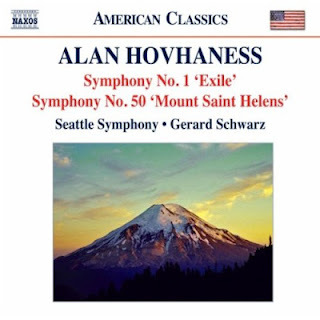 The clarity of the recorded sound is impressive, and is all the more valuable for the directness and simplicity of Hovhaness' orchestral textures, which get every chance to shine here. No doubt Naxos have a good number of further recordings of this composer’s music lined up for reissue. I await them with great interest. You thought Otto Nicolai was just an opera composer? Think again. It turns out his day job for most of his short career was as a cathedral music director in Berlin, a position he inherited from Mendelssohn. And listening to the liturgical choral music presented here, most of it in premiere recordings, it is easy to hear stylistic connections with Mendelssohn's work. As a result, Nicolai takes on a role as choral composer similar to that of Ferdinand David in his concertos: the two men providing us with glimpses of what Mendelssohn's career may have been like had he lived long enough to produce a more substantial body of work in either genre. The programme for this disc begins with excerpts from a full Protestant liturgy, followed by some German psalm settings, and concluding with some Catholic material, an Offertorium and a Latin setting of Psalm 54. The music is Classical in conception but Romantic in execution. Each of the movements is short, and the phrasing and rhythms are all regularly structured. But the contours of the melodies and the occasional richness of the harmonies makes for impressively emotive music, although liturgical function always comes first. 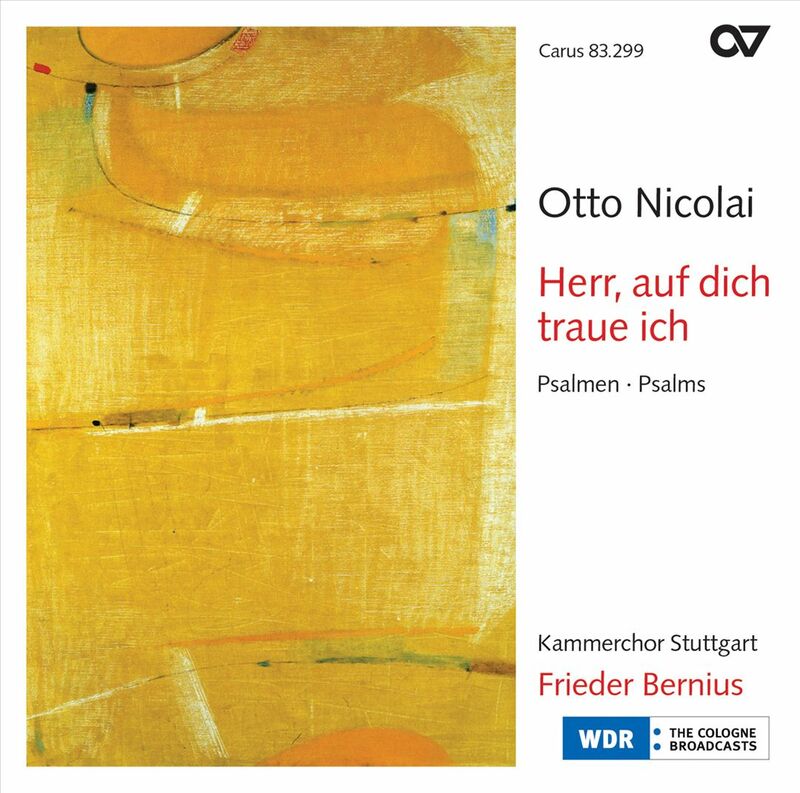 Interplay between soloists and ensemble is an important aspect of many of these works, especially the opening liturgy, where Nicolai sets words usually spoken by the priest as incantations for the soloists, with the full choir singing the responses. Frieder Bernius and his excellent Kammerchor Stuttgart are able to perform tuttis with such unity that the difference between soloist and ensemble becomes one only of tonal weight. Generally speaking, the textures are simple, and the liturgical function of the music means that the words always come first. The music is performed with a similar focus on clarity and articulation. The choir is small but the venue – the Immanuelskirche in Wuppertal – is large. That allows for plenty of atmospheric resonance, but the WDR/SWR engineers ensure that it never obscures the detail, nor those all important words. The two Latin works at the end of the programme are fascinating. Nicolai visited Rome in 1834 and presumably got a good dose of the Palestrina tradition at the Vatican while he was there. These two works were written after his return (the Psalm very soon after), and show just how much of an impression Palestrina had made. 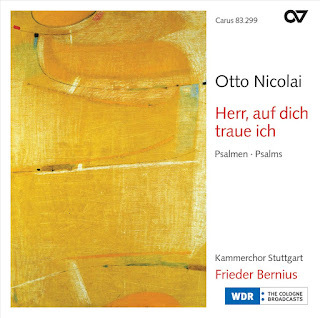 Nicolai follows Palestrina's imitative counterpoint, with ascending passage work passing between the voices. But his polyphony is much more basic, and his harmonies locate this music very firmly in the early 19th century. 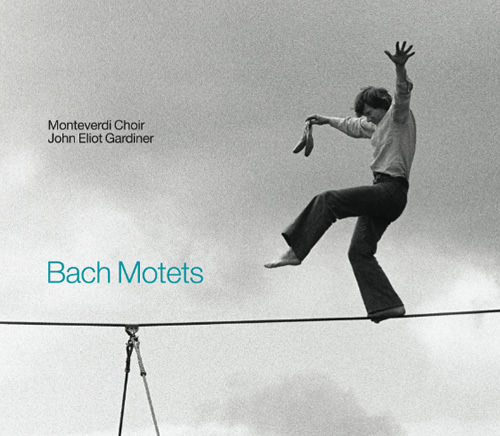 Carus are to be congratulated for bringing this fine, although by no means revolutionary, music to light. It turns out, though, that they have an ulterior motive. The label also has a publishing arm, which offers sheet music for all these works. Chamber choirs and church choirs looking for new repertoire may find something of interest here. 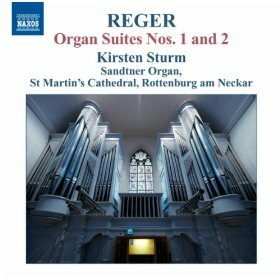 The Stuttgart forces make this sound easy, although I'm not sure the music is quite as straightforward to perform as the recording suggests. Even so, Nicolai clearly writes with his singers in mind. It's all enjoyable to listen to, and I'm sure it's rewarding to sing as well.